AmaWaterways continues to celebrate its favourite holiday, Valentine’s Day, with special offers for travellers and its travel partners. 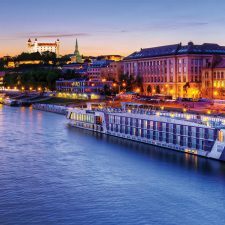 The specials include sailings on the highly anticipated AmaMagna, twice the width of traditional river cruise ships debuting in May with seven-night cruises on the Danube. With AmaWaterways’ “Sell Five, Sail Free” incentive program, agents who make five new FIT bookings on any 2019 sailing can receive a free seven-night cruise, valid on 2019 or 2020 departures. New for 2019, agents who double the five FIT bookings will earn a free cruise on the AmaMagna. For agents’ clients, those who book July 21 or July 28 departures on board AmaMagna can save up to $1,440 per stateroom, or book one of the ship’s ocean-style, triple occupancy suites and bring a third guest sharing the suite for free. In addition to AmaMagna’s special offer, AmaWaterways is delivering WAVE savings of $240 per stateroom on select 2019 Europe, Southeast Asia and Christmas Market sailings. Available through March 31, WAVE savings can be combined with existing retail offers and savings for past guests.